Some recent articles point out a common problem that businesses encounter with their managed service provider: Getting services you don’t want, but not getting the services you really need. According to Infosecurity Magazine, a survey from LogicNow revealed that managed service providers who offer security solutions to their clients consider their priority offerings to be proactive updates and patching, along with consultancy. However, what IT departments say they really need is advanced email security, improved web protection and anti-virus measures. The managed service priorities of patching and updates ranked toward the bottom of their IT needs. The LogicNow information also showed a disconnect in how services were priced and invoiced. IT departments, the article stated, tend to want the services invoiced together on a monthly, bi-annual, or yearly basis, rather than invoicing each technology separate or on an ad-hoc basis. Beyond security and pricing, other issues are creating a gap between businesses and their managed service providers, according to MSP Mentor. Some managed service companies are failing to provide their clients with backups, assuming that those backups are automatic. As part of the monthly maintenance that a managed service provider offers, the article states, should verify that backups have taken place and that there is a complete system state stored for each server. Additionally, MSP Mentor notes, regular management of a client’s cloud service should provide complete reports and logs of all actions taken during that period. This not only lets the business see the value of their managed service provider, but also to be aware of any problems that may be looming. A recent Forbes report states that a good managed service provider needs to be able to scale its services to best maximize its clients’ potential for growth. Infrastructure-as-a-Service and business applications look to be the most sought-after services that a provider will be able to offer in the near-term, the report notes. Some of the problems that businesses have with switching to managed services include concerns about price, security and privacy, and worries about legacy systems and other technology issues. 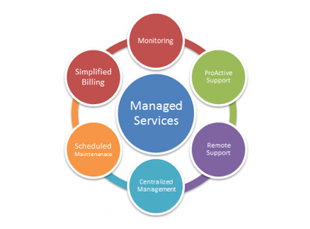 You deserve to have the best-managed services available, to see the results and documentation of those services, and to have a clear understanding of the services you are being billed for. Further, you deserve to have control, not only of your system but of your services, as well. If you’re not getting all of those things, then — chances are — you’re dealing with Bad IT Service (BITS). GeekTek can rescue you from BITS. We start by providing a complete assessment and audit of all of your IT resources, and a system and network audit. We lock out all previous IT personnel and retrieval of your system logins. We document your systems, recover your data, and verify that your backups are complete. You maintain full control of your system network and all of your accounts. We ensure that your domain names, web hosting, social media accounts and 3rd party web services are owned by you and that you have the accounts and passwords of all of your active resources. After we’ve completed our BITS rescue services, we are pleased to provide services to help your business grow. Whether you’re looking for full IT services including day-to-day management of your IT needs from exceptionally qualified teams, virtual CIO services that include a design and implementation of your company’s IT strategy, or consultation, we’re here to help. One size very seldom fits all, and our years of experience show us that one size never fits all when it comes to IT services. Get the services that fit the unique circumstances of your business. For more information on GeekTek and what we can do for you, contact us.